My correspondent Frank Aylmer has discovered these down-under places for the site. Aylmerton in New South Wales, 100km south-west of Sydney. Now a rapidly developing area, it was once not much more than a whistle stop on the railway line from Sydney to Melbourne. Trains still pass through this and the 1km Aylmerton tunnel nearby. Aylmer House in Akaroa on the Banks Peninsula of New Zealand’s South Island, built by Rev William Aylmer. There is also an Aylmers Stream which reaches the sea near Akaroa. 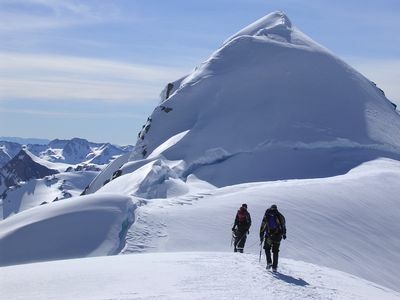 Mount Aylmer in New Zealand’s Southern Alps. At 2699m (8655ft) it doesn’t quite match its Canadian namesake in height but is a far tougher climb by the looks of it. The peak was named by its surveyor Thomas Brodrick in honour of his wife, maiden name Helen Aylmer, and first climbed on 26 December 1910.